The foundation stone for construction of four-lane highway in upper Assam which was laid by Union Transport minister Nitin J Gadkari in May 2015 at the West Jorhat Sports Association’s playground today lies broken into small pieces. 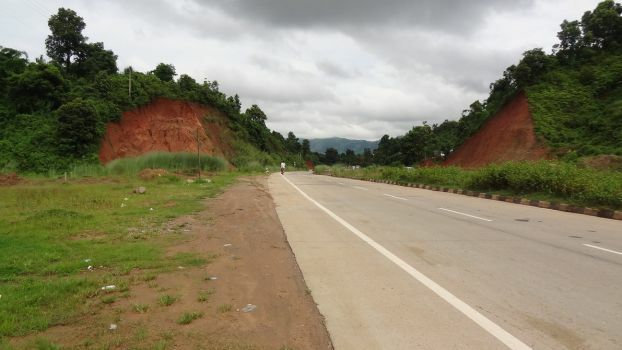 It is a different matter that more than three years on hardly any work of four laning has materialized in the upper Assam stretch from Nagaon to Tinsukia districts. Robin Saikia, general secretary of the West Jorhat Sports Association said that the foundation stone had been hurriedly laid by the then Tarun Gogoi led government and had already crumbled in places. “It was on the request of the district administration, the then deputy commissioner was Solanki Vishal Vasant, that we allowed the foundation stone to be laid on our grounds as the other site was waterlogged.The playground is owned by our Association and we have a miyadi patta to prove it,” he said. Saikia said that an excavator had been recently pressed into service to dig out a drain and the already crumbling edifice had been shifted by the workers. “How and when it fell and broke is unknown to us. We can be blamed as we had several times asked the NHIDCL authorities to shift it to another place,” he further said. The playground is at present hosting the second hand car mela organised by a company and the C division football league matches of Jorhat district sports association. The SP, Jorhat said that he was not aware of the destruction of the foundation stone and action would be taken only if vandalism had been done. It may be mentioned that Gadkari had also laid a foundation stone at Dibrugarh in 2016 for building a bridge connecting the largest inhabited river island in the world, Majuli, to mainlands Jorhat and Lakhimpur, which is also yet to see the light of day.